Skowhegan, Messalonskee play Tuesday at 7:30 p.m.; Oak Hill seeks redemption. 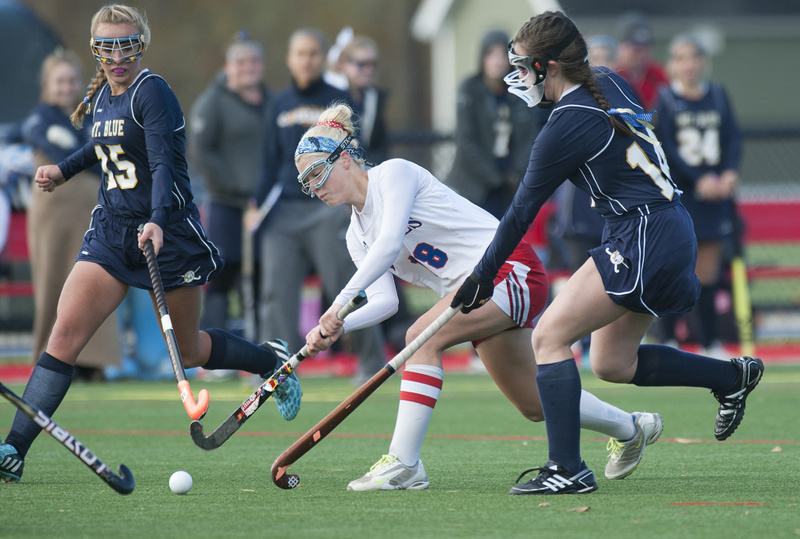 AUGUSTA — The unblemished Messalonskee field hockey team rolled through the Kennebec Valley Athletic Conference Class A regular season, posting 12 shutouts in 14 games. The dominant play continued in the Class A North playoffs, as the top-seeded Eagles (16-0-0) out-scored Mt. Ararat and Mt. Blue by a combined 13-0. Next up: Another showdown with Skowhegan (14-2-0), only this time the regional championship is at stake. Kevin Bennett photo Messalonskee’s Nathalie St. Pierre, center, splits the Mt. Blue defenders Hannah LeClair, left, and Gracie Foss and gets off a shot on goal during a Class A North semifinal game Saturday. The Eagles won 6-0 and will play Skowhegan for the regional title on Tuesday at Thomas College. Players to watch: Messalonskee — Emily Hogan (Sr., F), Riley Field (Sr., M), Nathalie St. Pierre (Sr., F), Hale Lowell (Sr., M), Lydia Dexter (Jr., D). Skowhegan — Leah Kruse (Sr., GK), Lauren LeBlanc (Sr., M), Brooke Michonski (Sr., F), Haley Thebarge (Jr., F), Julia Steeves (So., F). Outlook: In most years it is the Indians who are talked about as having dominated the competition, but this fall few teams have kept pace with the Eagles. Messalonskee handed Skowhegan its only losses this season and the Eagles have been on an impressive run. Messalonskee has won 11 of its last 12 games by at least three goals or more, with the lone outlier its 3-1 win over the Indians on Oct. 13. As impressive as the Eagles have been, though, few teams are more dangerous in late October than Skowhegan. Players to watch: Gardiner — Nickyia Lovely (Sr., F), Kaylin Manser (Sr., GK), Bryce Smith (Sr., M), Skye Lavoie (Jr., D), Maddy Beaulieu (Sr., M). Winslow — Delaney Wood (Sr., GK), Ciera Poulin (Sr., D), Jessica Greeley (Sr., D/M), Sabrina Jandreau (Sr., F), Susan Grant (Jr., D). Outlook: The Black Raiders have not missed a beat since moving up to Class B, as the defending Class C champs will once again be playing in a regional final Tuesday. In their only meeting in the regular season Poulin scored with 17:52 left in the second half off a penalty corner to give Winslow the win. Defensively the Black Raiders have been tough, with Poulin and Grant coming off strong performances against Foxcroft in front of Wood, a Miss Maine Field Hockey finalist. The group will certainly be tested by the Tigers and specifically Lovely, who became Gardiner’s all-time scoring leader in a 4-1 win over Camden Hills last Tuesday. Players to watch: Oak Hill — Kylee Veilleux (Sr., F), Brooke Surette (Sr., D), Makayla Nadeau (Sr., D), Abby Fuller (Sr., GK), Erika Hannigan (Jr. F). Lisbon — Abigayle Potvin (Sr., G), Olivia Leduc (Sr., D), Charlotte Mooney (Sr., F), Hannah Berube (Sr., F), Bree Daigle (Jr., F). Outlook: This is a rematch of last season’s regional final, which the Greyhounds won 2-1 in double overtime. Lisbon dropped eight of its first 10 games but has gone 5-1 since, including upset victories over No. 1 Dirigo and No. 5 North Yarmouth Academy. Oak Hill suffered just one loss last season — to Lisbon in the regional final — and graduated eight key players off that team. However, the Raiders picked up where they left off and are eager for another shot at the Greyhounds. Outlook: Dexter is making its eighth regional final appearance in 10 years. The Tigers have won six straight games and have out-scored their foes 18-0 during that stretch. They have also out-scored opponents 53-7 this season. MCI payed a predominantly Class B schedule, which worked in its favor once again. The Huskies have won eight of their last nine games and out-scored their opponents 7-1 in the playoffs. The rivals will square off at about 7:30 p.m. Tuesday in the Class A North title game at Thomas College. The Maine Principals’ Association on Monday announced starting times for all regional final games Tuesday. Thomas College is hosting the North regional championship games, beginning with the Class C contest at 3:30 p.m. between No. 1 Dexter (14-2-0) and No. 2 MCI (12-4-0). The Class B North title game between No. 1 Gardiner (14-2-0) and No. 2 Winslow (12-3-1) will follow about 5:30 p.m. The Raiders edged the Tigers 1-0 in the regular season. “I am thrilled to be going up against Gardiner,” Winslow coach Mary Beth Bourgoin said. “I am sure they would say the same thing with going up against us. It was a really good game during regular season, too. Gardiner is always a tough matchup. We thought this was going to be anybody’s tournament so we’re glad we’re here. We worked hard to get here. Fitzpatrick Stadium in Portland will host the South finals. No. 3 Oak Hill (11-5-0) will play rejuvenated No. 8 Lisbon (7-9-0) at 3:30 p.m. in the Class C final. The two teams met in the regional final last season, with the Greyhounds winning 2-1 in double overtime. The Greyhounds struggled at times this season when head coach Julie Petrie was out on maternity leave. However, Petrie returned a couple weeks ago and Gilbert said it’s no coincidence that Lisbon started playing better. The teams split their two regular season meetings, with Lisbon winning 1-0 in the regular season finale after the Raiders prevailed 2-1 in early September. York and Leavitt will play for the B South title at 5:30 while Cheverus and Thornton will follow at about 7:30 in the A game. The North regional finals at Thomas feature games between the top two seeds. Messalonskee swept the regular season series with No. 2 Skowhegan (14-2-0), winning 3-0 and 3-1. The Indians are seeking their 13th state title in 15 years. McLaughlin acknowledged it’s “a bit odd” having her Eagles seeded higher than the mighty Indians. “We don’t feel weird being here but it’s weird having people think that we should win this game,” she said. “It’s odd, but we’re all excited to go into this game and see what happens.